(P1) In February of 2012, a medical team at the UNIVERSITY OF MICHIGAN’s C. S. Mott Children’s Hospital, in Ann Arbor, carried out an unusual operation on a three-month-old boy. The baby had been born with a rare CONDITION called TRACHEOBRONCHOMALACIA: the tissue of one portion of his airway was so weak that it collapsed. This made breathing very difficult, and it regularly blocked VITAL blood vessels nearby. The infant was placed on a VENTILATOR, while the medical team set about figuring out what to do. (P2) The area of weak tissue would somehow need to be repaired or replaced—a major and dangerous operation in so small a patient. The team consulted with the baby’s doctors at Akron Children’s Hospital, in Ohio, and they soon agreed that they had just the right tool for this delicate, lifesaving task: a 3-D printer. (P3) AS ITS NAME SUGGESTS, a 3-D printer prints ink not on a flat surface, such as paper, but in THREE DIMENSIONS, in layers. The first 3-D printers were developed in the 1980’s, by an American engineer named Charles Hull. The “ink” was an liquid that turned solid when exposed to ULTRAVIOLET LIGHT, typically from a LASER BEAM. (P4) Makers of cars and airplanes could design complicated parts on a computer; now they often print the part, too. 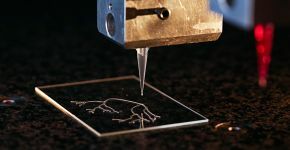 Three-dimensional printers have become inexpensive and are everywhere. STAPLES and AMAZON now offer 3-D printing services, and the list of 3-D-printed products generally available includes nuts, bolts, eyeglasses, athletic cleats, jewelry, “Star Wars” figurines, architectural models, and even entire houses. (P5) In the United States, debates have ERUPTED over whether citizens should be allowed to 3-D-print handguns at home, which the technology makes possible. Today’s printers print in plastics, and also in silver, gold, and other metals, along with ceramics, wax, and even food. (P6) The medical procedure at the University of Michigan worked on a similar principle. The researchers began by taking a SCAN of the baby’s chest, which they converted into a highly detailed, three-dimensional map of his airways. From this model, they designed and printed a SPLINT—a small tube, made of the same material that goes into SUTURES—that would fit SNUGLY over the weakened section of airway and hold it open. (P8) This sort of procedure is becoming more and more common among doctors and medical RESEARCHERS. Surgeons are implanting all types of BODY PARTS. The supporters of 3-D printing claim that the technology allowing us to print things that are more personal and intimate. This appears to be even more true in medicine: increasingly, what we are printing is ourselves. According to P5, “In the United States, debates have erupted over whether citizens should be allowed to 3-D-print handguns at home, which the technology makes possible.” What is your opinion? Do you think citizens should be allowed to print handguns? If you had a 3-D printer, what sort of thing would you design and print to make your life easier? Share your thoughts with your Cambly tutor! What does “as its name suggests”, “body pts” and “unforeseen problems” mean? Practice using each expression in a sentence; extra points if you can use it in conversation.